The Lenovo Z5 Pro GT will have a carbon fibre finish on the back side. It will have black and red coloured patterns under the glass for better looks. In the front side it will have a 6.39 inch Full HD+ super AMOLED panel with 1080x2340 resolution. This will give the display an aspect ratio of 19.5:9 with 403 PPI pixel density. The display will contain the fingerprint sensor also under it. This smartphone will be carrying one of the fastest processors till date, the Snapdragon 855 by Qualcomm, which was recently launched with 5G modem inside. This chipset is clocked at 2.84 GHz (maximum) and will have the Adreno 640 GPU for better graphics experience with Elite Gaming technology. You can check the full details of the new SoC by clicking here. 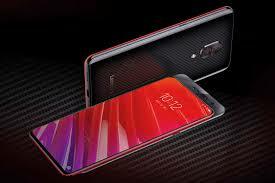 In the software side, the Lenovo Z5 Pro GT will be running on the latest Android Pie (9.0) out of the box with Lenovo's own ZUI 10 on the top. Performancewise, the Lenovo Z5 Pro GT confirms the best out of it. The Lenovo Z5s Pro GT with have dual camera setups on both side of the phone. On the rear side, a 16 MP Sony IMX519 sensor with f/1.8 aperture will work as the primary camera. The other one will have a 24 MP Sony IMX576 sensor as a secondary camera. In the front side, a 16 MP sensor will work as the main selfie shooter with f/2.2 aperture. The second camera will have a 8 MP IR sensor and will work for face unlocking purpose. Now this can be the most interesting section of the smartphone. Like other phones, the Lenovo Z5 Pro GT will also have the regular 6GB and 8GB ram variants with 128 GB storage options. The pricing of them is set at 2689 Chinese Yuan (29,000/- INR approx) and 2998 Chinese Yuan (35,000/- approx). Two of them already look very budget-friendly. 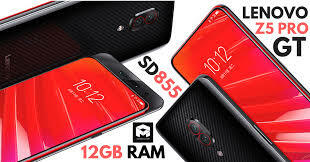 But Lenovo added another version of 12GB ram with 512GB on board storage that promises to open 50 applications simultaneously. This sounds out of imagination till now. This variant will cost 4398 Chinese Yuan (45,000/- INR approx). Lenovo is seriously doing very aggresively in terms of pricing. The Lenovo Z5 Pro GT will feature a 3350 maH Li-po battery under the hood that can power it for a whole day with the AMOLED screen. The connectivity section will have Wi-Fi 802.11 a/b/g/n/ac, dual-band, WiFi Direct, hotspot, dual VoLTE, Bluetooth 5.0 with A-GPS,NFC and a type c port with fast charging support. Though the 5G connectivity has not been confirmed by the brand. It will be available for booking from 15th Jan, 2019 and will go on sale from 24th of the same in China. This will be the most feature packed flagship phone with most decent pricing from Lenovo. Well, Lenovo has done many blunders in 2018, but didn't bring any of them to India. If you are really interested about Lenovo's any smartphone of this year, please share this article to Lenovo officials. Thank you.